The generalized function matching (GFM) problem has been intensively studied starting with . Given a pattern p and a text t, the goal is to find a mapping from the letters of p to non-empty substrings of t, such that applying the mapping to p results in t. Very recently, the problem has been investigated within the framework of parameterized complexity . In this paper we study the parameterized complexity of the optimization variant of GFM (called Max-GFM), which has been introduced in . Here, one is allowed to replace some of the pattern letters with some special symbols “?”, termed wildcards or don’t cares, which can be mapped to an arbitrary substring of the text. The goal is to minimize the number of wildcards used. 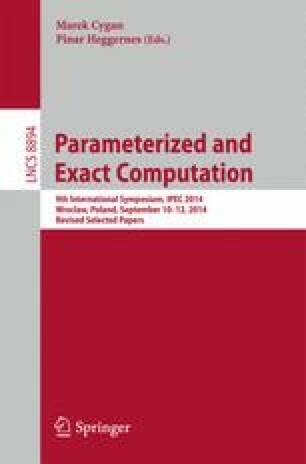 We give a complete classification of the parameterized complexity of Max-GFM and its variants under a wide range of parameterizations, such as, the number of occurrences of a letter in the text, the size of the text alphabet, the number of occurrences of a letter in the pattern, the size of the pattern alphabet, the maximum length of a string matched to any pattern letter, the number of wildcards and the maximum size of a string that a wildcard can be mapped to. Sebastian Ordyniak — Research funded by Employment of Newly Graduated Doctors of Science for Scientific Excellence (CZ.1.07/2.3.00/30.0009).